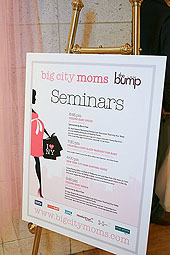 baby meets city: biggest baby shower... ever! What you have, my friends, is about as close to sheer excitement as any pregnant woman gets these days (I'm speaking from experience). The event is currently sold out, however you can be put on a wait list for a standard pass. See more information on that here. Stay tuned for an after-party synopsis -- no doubt the only time in 9 months that a pregnant woman utters the words after-party. That must be so cute - all those pregnant women in one place! Did you have a great time? !